You can hear Part 1 of my two-part introduction to The Demon of Brockenheim here for free on Far Fetched Fables. Part 2 will be available next week, and I will post the link when it is. Thanks for the PDF! It looks like an intriguing tale! My pleasure! I think it's a fascinating read. I hope you enjoy it! Woot! Sounds like a great listen and an enjoyable read, thanks! Yay! You're most welcome. :) I hope you enjoy! I haven't had time to read any of this yet, but I wanted to thank you for posting this! 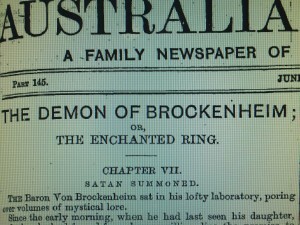 I love investigating the Gothic literature. I just finished Radcliffe's The Italian. I've read some obscure things too, but I wasn't aware of this one at all. Have you ever read "The events at Poroth Farm" by T.E.D. Klein? It's an interesting Lovecraftian tale in which the narrator keeps a running tally of the Gothic books he is reading and his reactions to them. It was later expanded into a novel, but 'tis better to read the novella first. It's been collected three times I believe. I love that one of his story collections was called Reassuring Tales. My pleasure! I love The Italian. Although now when I read the descriptions of Schedoni, I can't help but think of Severus Snape! Have you ever read "The events at Poroth Farm" by T.E.D. Klein? Oooh, I have not. But it sounds like something I'd really enjoy. It's going on my "find this and read it" list. Thanks so much for the recommendation!